If you’re a huge fan of the WebKit based, fast loading Google Chrome web browser, but a bit dissatisfied by the fact that it has some proprietary libraries and also the original Chromium having a few different licenses to itself (MIT, LGPL, BSD etc) including few non-free ones (according to Wikipedia) and looking for a fully open source WebKit based web browser as a result, then perhaps you might wanna try “QtWeb”. It’s a simple web browser but at the same time gives you a decent amount of options too. Doesn’t need any installation, so you can easily use it as a portable one as well. And it is not a new browser and has been there for sometime now. Anyhow, it lets you easily configure privacy related settings (where Google Chrome has somewhat, a bad reputation) plus even supports the BitTorrent protocol by default, so you can download torrent files without having to install a BitTorrent client. *. Runs in GNU/Linux, Windows and Mac OS X. *. Since it’s based on WebKit, it loads web page fast and I didn’t encounter any page rendering issues while using it. *. Easily enable/disable Java scripts, Pop-up blocker, cookies, loading images, proxies etc. *. Built in “web search” tab (search engines can be added/removed easily). *. As mentioned above, has a built in, simple BitTorrent download manger (start/pause/stop, change download/upload speeds, supports multiple downloads etc) that gets the job done. For instance, if you’re having troubles with a particular web site while using QtWeb, then you can change the user agent to “Firefox, Internet Explorer, Safari, Chrome …” as a fix, so the web site would think that you’re in fact using one of those browser and act accordingly. It won’t always resolve every issue, but it’s helpful nonetheless. *. You can also use its “Preferences” page to adjust few more options such as: changing the default home page, change between few built in themes, add/remove tool-bar items, manage history/cookies and passwords, configure “AdBlock” plugin’s settings, change Proxy settings, customize keyboard shortcuts and a few more. *. Has the ability to save web sites in the PDF format. *. And especially, unlike with Google Chrome or Chromium, it displays a warning when you try to close the browser window, when you have multiple tabs opened. These are some of its main features to mention. 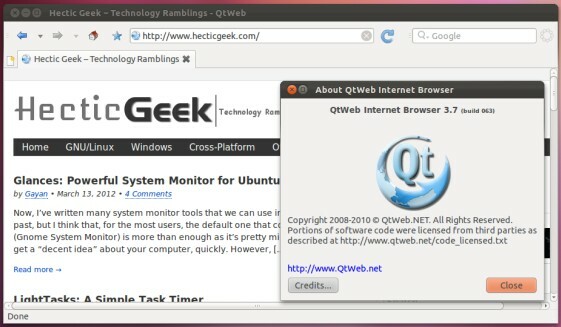 You can install the latest version of QtWeb in Ubuntu 12.04 Precise Pangolin, 11.10 Oneiric Ocelot, 11.04 Natty Narwhal and 10.10 by using a PPA provided by “Nathan Rennie”. For that, open your Terminal and enter the below commands. Other users, please visit this QtWeb’s download page and get your appropriate package. For other GNU/Linux distributions, they have a single executable file, which according to the developers works on number of distributions (Fedora, Mandriva, OpenSUSE, Cent OS, even Ubuntu etc) without having to compile anything. One thing though, in Ubuntu 11.10, after installing, the Unity Dash couldn’t find it (boooo)). So every time you want to launch it, you’ll either have to put the below command in your Terminal window (note that the “Q” and “W” are capital). Or, you can enter the below command (only once) and it should create a shortcut on your desktop, which you can use to double click and open it easily, as a temporary fix (replace “gayan” with your user name). Then later you can change its icon if you like, for a little eye candy as well ;-). 1. first download the compressed package. 2. Then create a folder called “qtweb” in your Home folder. 3. Now extract the downloaded package’s content to that folder (“qtweb” in your Home folder), and enter the below command (only once), otherwise the OS won’t let you run it (again, please replace “gayan” with your user name). Then you can just double click on that file and it should open up “QtWeb”. That’s it!. So as an ending note, if you want a web browser that has a minimalist appearance, loads web sites fast and even has a simple BitTorrent client built into it, then QtWeb seems pretty nice to me. Good luck. followed your instruction in ubuntu 14.04 but not failed. Kubuntu 17.10[fix]: Fonts Looks Too Big After Enabling Nvidia’s Proprietary Driver? Linux Mint 18.3 Cinnamon Review: Best ‘Linux’ Distro for Beginners! Improve your skills, better your prospects, and make more money with training The Linux Foundation! How to Remove PulseAudio & use ALSA in Ubuntu Linux?